Hangzhou has flights to and from over 130 destinations, including 100 or so domestic cities and around 30 international destinations. Popular destinations include Amsterdam, Los Angeles, Tokyo, Beijing and Shanghai. Hangzhou Xiaoshan International Airport is the only civil airport in the city. This airport ranks third in the southeastern China. Over 40 airlines serve around 250 air routes at this airport. The airport is 27 kilometers (21 miles) east from the city center. There are now 2 terminal buildings to cater the domestic and international passengers. Passengers can transport between the airport and the downtown area by shuttle bus or taxi. Hangzhou carries out the 144-hour visa-free transit policy for foreign passengers from 53 countries/regions, which means the qualified passengers can enter downtown and some nearby cities from the airport and travel around for up to 144 hours without a China visa. How much does it cost to fly to Hangzhou from overseas destinations? The fares of international air tickets change very often. In normal condition, the price of a one-way economy class ticket from Los Angeles fluctuate between CNY 3,000 - 5,000, from Amsterdam fluctuate between CNY 4,000 - 8,000 and from Singapore fluctuate between CNY 1,000 - 3,000. 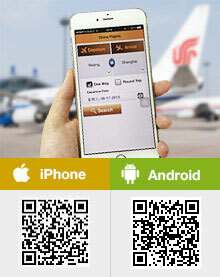 Passengers can search for the real-time prices and the prices of more flights via the search box on page top. 1. In general, passengers who want to buy a cheap air ticket are recommended to make reservation 1 - 3 months before hand. The chance of getting a special offer gets slimmer when the departure date gets nearer. If you are going to take a domestic flight, book an air ticket at least one week ahead; if an international flight, make a reservation at least 2 weeks in advance in case of selling out. 2. If you get a very cheap ticket from low cost airlines like Scoot Airways, do pay attention to the luggage allowance because the extra charge for excess baggage can be very costly. 3. Hangzhou is a tourist city, so try not to fly there in public holidays like Chinese New Year and National Day Holiday because there is often no special discount for air tickets then. In other time period, the discount for domestic air tickets is averagely 30% to 60% off in low season from November to next March and 20% to 40% off in high season from April to October. 4. For international passengers, if they fail finding the through air ticket to Hangzhou or the through tickets are too expensive, they can fly to Shanghai first and then take high speed trains to Hangzhou. This kind of transport combination sometimes saves a lot. Is there any direct fly from Iran to hangzhu? The only airport in Hangzhou is Xiaoshan International Airport. There are three terminal buildings. Which flight number you will take? can I buy international flight tickets cash at the airport? You can do it by cash at the airport directly.